The existential crises involved in translation are part of our political life, especially in times when the closing of borders symbolized by Brexit and the triumph of Donald Trump, present new challenges to those living lives of immigrancy and those waiting at the borders. How to resist the emotive tide of populism and, in particular, the language that legitimates exclusion? How to confront the anxieties of inclusion? These challenges are increasingly pressing. The 2016 Conference of the International Network of Philosophers of Education sought to address such concerns through the theme ‘Philosophy as translation and the understanding of other cultures’. The chapters included here represent the breadth and richness of that conference, addressing questions of ethics, desire, religious understanding, intercultural philosophy, and practices of higher education and teacher education. The processes of translation they discuss are not limited to linguistic translation as conventionally understood. 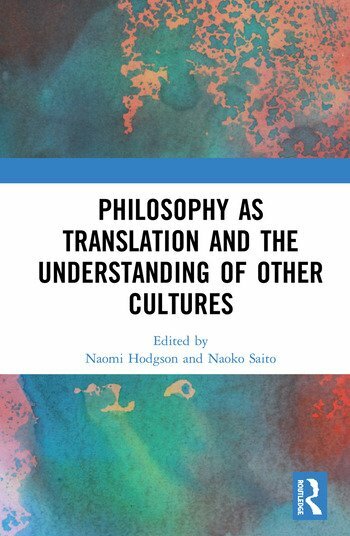 Instead translation is taken to be a window through which to understand how we, as linguistic beings, are constantly in a process of transformation, and how our personal and cultural identities are, hence, also already involved in processes of translation. This book was originally published as a special issue of Ethics & Education. Naomi Hodgson is Lecturer in Education Studies at Liverpool Hope University, UK, specialising in educational philosophy. Her current research focuses on the role of digital technologies in reframing the parent-child relationship. Her publications include Philosophy and Theory in Education: Writing in the Margin, with Dr Amanda Fulford (Routledge, 2016). Naoko Saito is Associate Professor at the Graduate School of Education, Kyoto University, Japan. Her area of research is American philosophy and pragmatism and their implications for education. She is the author of The Gleam of Light: Moral Perfectionism and Education in Dewey and Emerson (2005) and America Tetsugaku no Yoake (The Dawning of American Philosophy) (2018, Japanese), and co-editor (with Paul Standish) of Education and the Kyoto School of Philosophy (2012), Stanley Cavell and the Education of Grownups (2012), and Stanley Cavell and Philosophy as Translation: The Truth is Translated (2017).